Despite opening night’s scathing press remarks on December 26, 1831, Norma would ironically go on to become Vincenzo Bellini’s greatest opera in his short life. 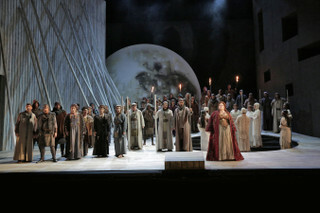 Norma, that quintessential bel canto (work), would also hold personal significance for Maestro James Conlon because he hadn’t conducted this extraordinarily difficult tragedia lirica since 1978 when it was staged in concert format at the Hollywood Bowl featuring soprano stalwarts Marilyn Horne and Montserrat Caballé. What an evening that must have been. Perhaps this long absence explains why James Conlon, while impeccably driven to cue any music, was particularly impassioned and poised to deliver. Even more so, due to a last minute announcement that an indisposed Angela Meade would still go on to sing the role. This might explain the unfolding of vocal events. The conclusive portion of Bellini’s morose-laden “Overture” revealed Barney O’Hanlon’s choreography of diaphanous young priestesses providing movement and exquisite shadowed silhouetting through veteran Duane Schuler’s artistic lighting. Under the direction of Anne Bogart, this Norma used women’s fluidity in an otherwise static operatic work that melded quite nicely. O’Hanlon kept returning to a running thematic fold of Druid priestesses in varying circular formations as if to delicately imply references to England’s Stonehenge. Morris Robinson’s Oroveso introduced Grant Gershon’s men’s chorus with equitable delivery, yet the leader’s projection was vacillating: the attempt to razzle his henchmen became diluted by Mr. Conlon’s orchestral volume. Fortunately, this beautifully deep, rich bass voice shortly returned and retained light and substance in Act II. Originally situated in Roman-occupied Gaul in 50 BC, the set by Neil Patel was updated, while not expressly offensive, it was a bit modernized with minimal landscaping. The Druid temple and surroundings were set upon an undulating sloped stage with curvilinear walls and windows to signify a Druid fortress on one side of the stage. Erring on earthy and essentially monochromatic tones, Norma’s multi-specific scenes inside this two act Bellini œuvre were ambiguous. Patel sought clarification via simple symbolic props (i.e. rising/falling white drape, table, mistletoe) to denote locational changes. For Norma, the opera, this issue is a tad trivial. Nonetheless, an unanimated handful of Roman warriors (costuming by James Schuette was overall pleasing and period-appropriate) arrived to introduce debuting Russell Thomas as Pollione. Newcomer to LA Opera and filling the shoes of Flavio, Rafael Moras’ vocalization was simply washed away as he prodded Thomas to sing two of his opening cavatinas. Mr. Thomas, indeed possessed éclat artistique; however, this section gathered pockets of inconsistent volume (this was to be otherwise corrected in the subsequent act with magnificent control.) Elements of fickle intensities amongst several principals could point to a sound control glitch? Quite possibly, for the second act bettered in quality…or was there another reason? Since she has championed Wagner and Verdi, it was a delight to be introduced to sought-after Angela Meade in the title role. Earlier, Ms. Meade collectively referred to Norma as “Mount Everest.” This comment was especially apt in this performance because she was ‘under the weather’, quite possibly reasoning why she began her spotlight aria “Casta Diva” in a rather lightly veiled voice. Perhaps hesitation and the need to assess her condition cautiously in real time may have crept inside her head. While her vocal control was excellent, it garnered timidity and a bit of uncertainty. In this section the voice occasionally quivered. Nonetheless, the delivery was poised. The longer she was on stage, her dramatic coloratura timbre kept building greater momentum and confidence; technique and sustenance improved and impressed, particularly inside Bellini’s long lyrical lines. This talented singer graciously tackled the giant and adeptly forged ahead. Act I seemed to have elements of capriciousness. Maybe the question mark surrounding Ms. Meade’s condition created unspoken nuances of trepidation amongst her fellow principals. Undoubtedly, Act II showed singers breathing more comfortably inside their character, exhibiting less restraint and allowing Bellini’s slow tempi and moving lines to flow more freely. Despite the “whatever”, Ms. Meade evinced a power house of anguish, both love and betrayal, through finely crafted technique and infallible vocal gyrations. Rome, Georgia-native Jamie Barton made quite the favorable impression as the young priestess, Adalgisa. This mezzo-soprano was well positioned in her lower tessitura, and her duet with Norma, “Oh! Rimembranza!”, sung in occasional thirds, was balanced, precise and heavenly. Choral beauty through Grant Gershon exuded lyrically evened proportions. While the Bellini requisite of off-stage singing produced a celestial blend, the male choral “Intermezzo” (Act II) brought to mind Verdi’s “Va, pensiero”, a sort of personalized Risorgimento souvenir during Bellini’s life. 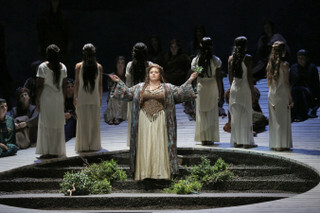 If demands on a singer are deemed overwhelming, the demands to sing Norma are overwhelming and ‘then some.’ With an uncertain landmine lying in its path for Angela Meade last evening, this accomplished soprano is to be lauded on all fronts for climbing her own Mt. Everest.